In somewhat unsurprising fashion, Nintendo hasn't been the best source for information on its still-under wraps game console, the Nintendo NX. Following on that trend, a user named Disorienter on the fansite NeoGAF discovered a new patent for what looks like the Nintendo NX's controller. Seen in the pictures above and below, the controller looks to be using motion and touch controls, similar to how you use a mobile phone. But the controller won't be all touch-controlled, either. There appears to be two shoulder buttons, two thumbsticks and some form of card slot. Where are the traditional A,B,X,Y buttons, you ask? One theory floating around is that the controller's touch screen will display contextual controls. So instead of pressing the 'A' button to jump, you might instead see a jump button on the screen. Seeing clear, well-labeled prompts on the second screen might help younger players that are transitioning from mobile games, and could enable developers to provide gamers more unique ways to control the action on-screen. 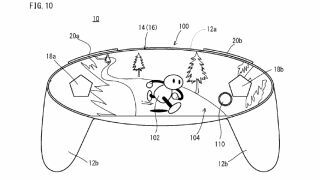 Now, of course, we have to treat the patents more as proof-of-concepts rather than a hard and fast promise from Nintendo, but what's here is interesting. Multiple slots on an open interface would make sense for games like The Legend of Zelda where you need to swap between weapons to get past enemies, while double control sticks give Ninty the option to make more first- and third-person shooters like the phenomenal Splatoon. CES 2016 is right around the corner, are you ready?